Bishop Elly Mogodiri of St Oaks Global Church of Christ, in Hartebeespoort, north of Johannesburg, has opened a case of organised crime and fraud against Prophet Alph Lukau. 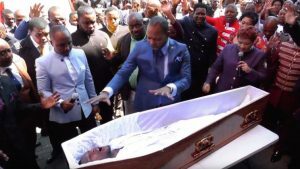 This after a recent video showing Lukau of Alleluia Ministries in Sandton went viral on social media after he claimed to be praying for a dead man, who was then resurrected. The church claimed that the body came straight from the mortuary to its premises. But, the funeral service whose vehicle was used to ferry the alleged deceased man to the church has dismissed this as a ‘hoax’. Bishop Mogodiri says he is angered by false prophets who are distorting the bible for their own benefit, as well as commercialising the church. The post Organised crime, fraud case opened against Prophet Lukau appeared first on SABC News – Breaking news, special reports, world, business, sport coverage of all South African current events. Africa's news leader..